This neckwarmer is the chicest way to stay warm in the spring. 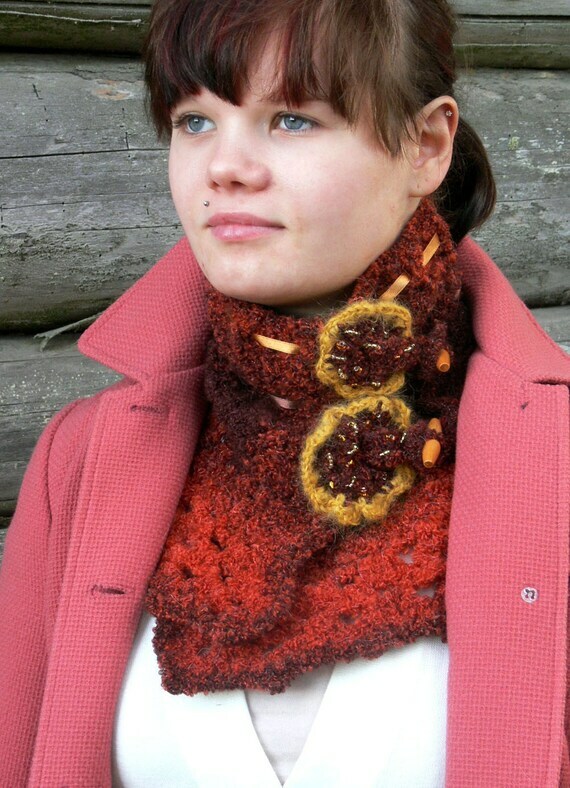 It is made with different shades of brown yarn (wool and acrylic blend), it`s very soft and warm around your neck. IÂ´ve added brown and beige ribbons to make it chic. ItÂ´s easy to fix the scarf with wood buttons. If You would like to have a different color combination, please let me know and I will make it to order. Absolutly unique and one of a kind, this neckwarmer could be a main accent to Your outfit and will sure get You noticed. Wear it to stand out from the crowd! Handwash and lay flat to dry on a towel to retain shape. Please send a message if You have further questions. Folksy :: "Charlie the Elephant"